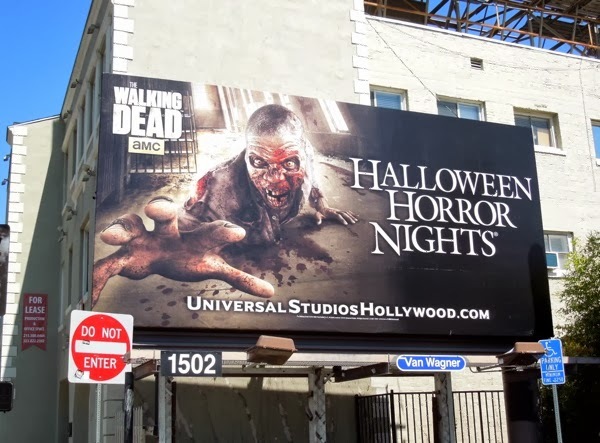 In honour of The Walking Dead's fourth season premiere last night (wasn't it good), and the fact that Halloween is fast approaching, here are some creepy billboards for Universal Studios Hollywood's annual Halloween Horror Nights. 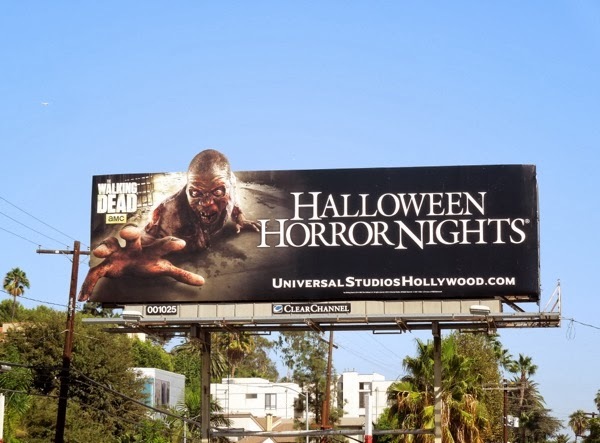 Whilst The Walking Dead TV series promo billboards tend to be more atmospheric, the themed creatives for the amusement park attraction are much much gory and focus of the scary zombies from the critically-acclaimed show. 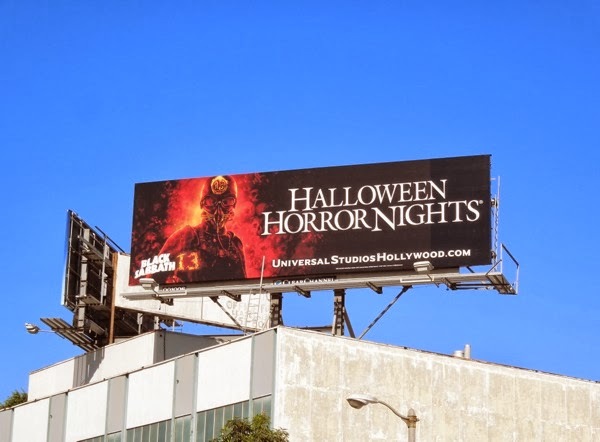 In addition to the undead-themed attractions at Universal Studios, the theme park also has other Halloween frights in store for visitors like new mazes based on horror films the Evil Dead and Insidious, plus a unique interactive maze experience inspired by the legendary heavy metal band Black Sabbath's music and their nineteenth studio album, unluckily entitled '13'. 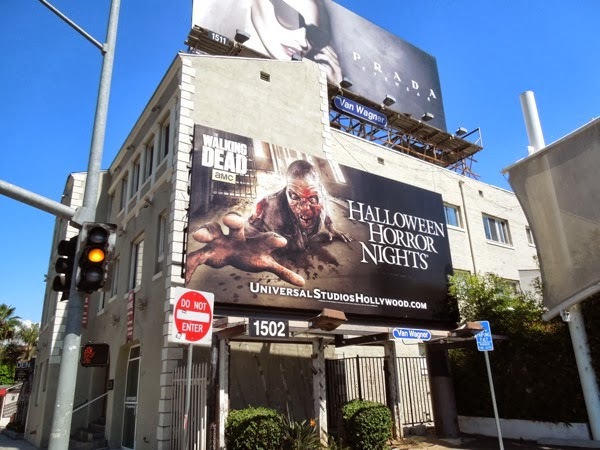 There's also scare zones courtesy of new movie The Purge and Curse of Chucky, plus a Terror Tram where visitors are attacked by The Walking Dead zombies, which sounds like a horror fan's dream event, and everyone else's nightmare. 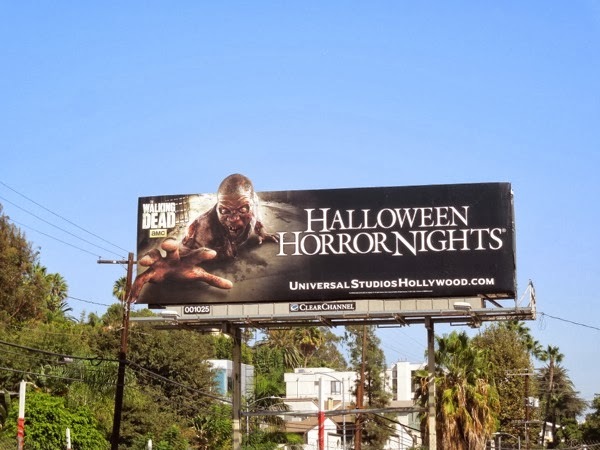 Daily Billboard especially likes the special extension billboard for The Walking Dead Halloween Horror Nights with the rotting zombie's bloody outstretched hand crawling out of the prison from the series. 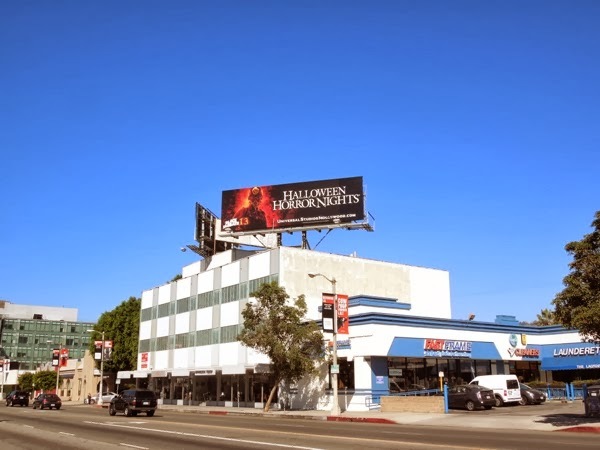 The smaller zombie billboard was first spied along Sunset Boulevard on September 7, whilst the Black Sabbath 13 version was spotted high over Beverly Boulevard on October 5 and the special extension billboard snapped terrorizing motorists along Highland Avenue on October 11, 2013. 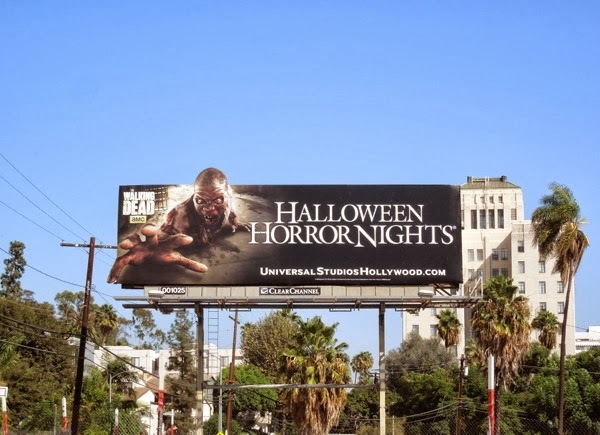 If you like these creepy ad creatives, be sure to check out the equally eye-catching Halloween Horror Nights billboards from 2012. 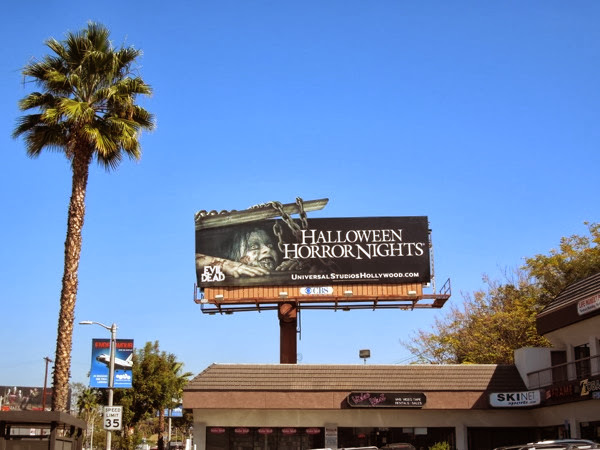 Happy hauntings one and all, and here's to a horrific Halloween and more spooky billboards in the days to come. 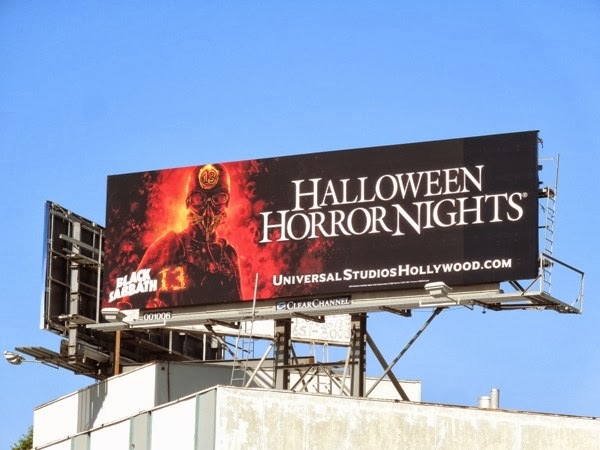 UPDATED: Imagine Daily Billboard's fiendish delight when we spied another special extension billboard for Universal's Halloween Horror Nights along Ventura Boulevard in Studio City on October 23, 2013. 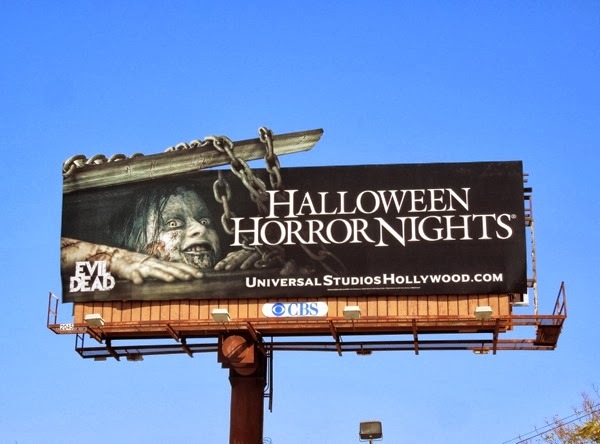 This themed version for the Evil Dead is truly creepy, because let's face it, you can''t keep a demonically possessed girl down, no matter how many chains and basements you throw her into. 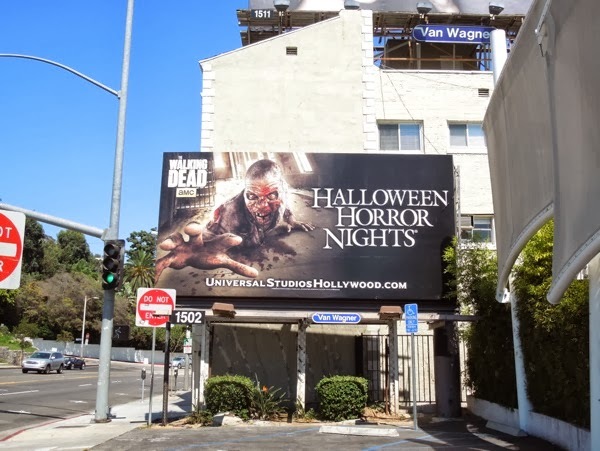 If you like this unsettling ad, be sure to also check out these Evil Dead movie remake billboards from earlier this year.